Making these cubes took me all of 3 minutes, plus freezing time of course. Each tray requires 2 large grapefruits squeezed. 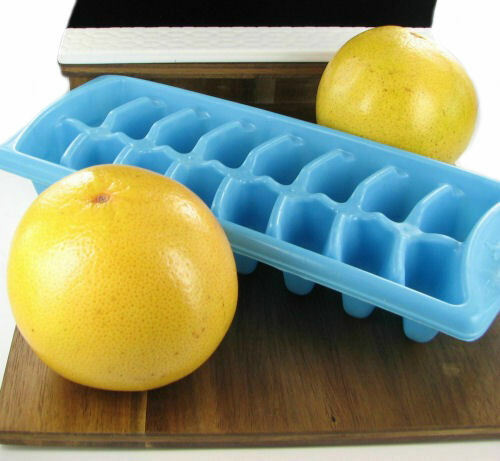 All you need are fresh grapefruit, a juicer and some ice cube trays. 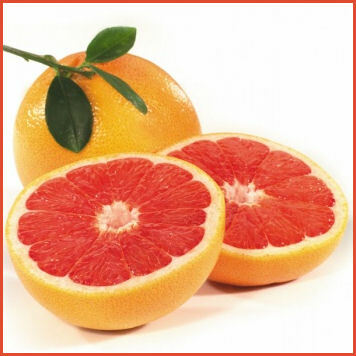 Just cut the grapefruit in half and squeeze over a juicer (I used a hand juicer and it worked fine) then place the juice in ice cube trays. 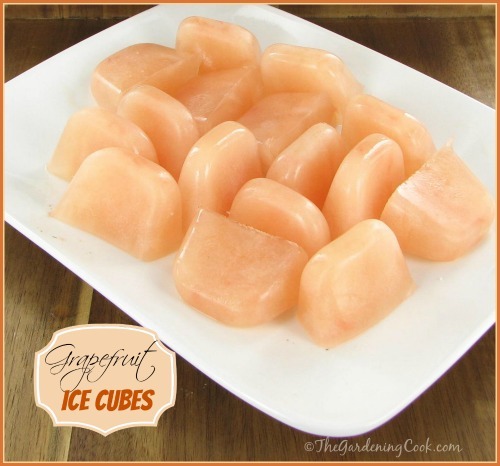 Place the ice cube trays in the freezer until set and enjoy in your favorite drink. 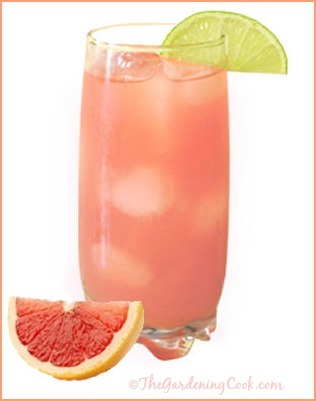 The ice cubes can be used in all sorts of drinks, both alcoholic and not, for a refreshing extra taste of grapefruit. The ice cubes take a bit longer to set than those made with just water. I checked mine about 6 hours after I put them in the freezer and they were still a bit tacky, so you’ll need to make them well ahead of the time you want to use them. Even today when I took them out, they were still tacky but frozen solid and perfect to use in drinks. I added them to some Minute Maid 15 calorie lemonade for a great tasting and lo cal drink. 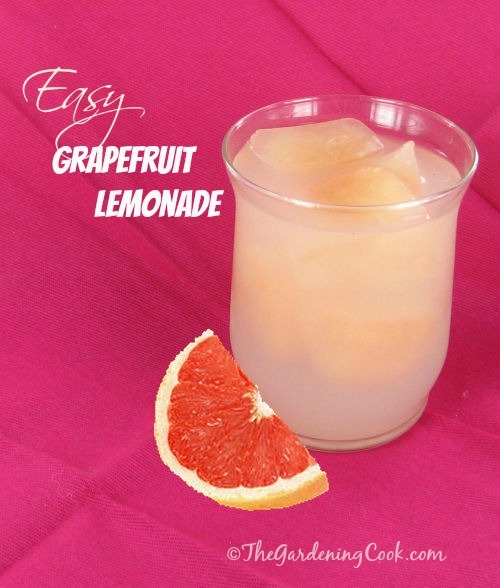 It started out tasting like lemonade and as the grapefruit ice cubes melted, it took on the grapefruit tang. Just lovely! Julie Alexander also suggested that I mix with seltzer or tonic water, and it will takes almost like Fresca. Or add them to white wine or champagne for a great tasting cocktail. 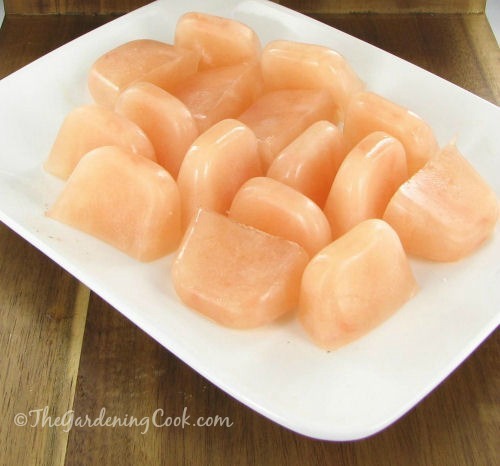 There are so many uses for these grapefruit ice cubes. Off to add some of these ice cubes to my Grapefruit, Cranberry Sea Breeze Cocktail! A nice book, a seat in the garden and my day is complete!